Life as Pink Einstein | Dallas Fashion and Lifestyle Blogger: Sweater Weather! 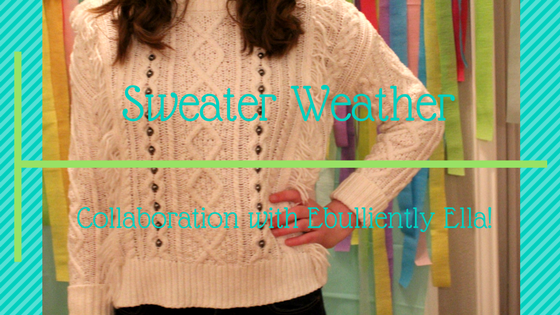 Today I am collaborating with Ella from Ebulliently Ella to share my two favorite sweaters to wear in sweater weather. The past week has been perfect sweater weather and we even got a little bit of snow! My first sweater is this cream colored cable knit sweater that I purchased at JCPenney. It has fun fringe hanging off of the front of the sweater, a thick cable knit design, and studs. I love this sweater because it goes with a ton of things and I've never seen one like it! It's also perfect because it's really thick and will keep you warm. The sweater is cropped but the sleeves are kind of long so I roll the cuff of the sleeve up once. I like to pair this sweater with a pair of jeans and my brown riding boots. I wear my pearl bracelet or my charm bracelet with it as well but I don't wear a necklace because the sweater already has a lot going on. My second favorite sweater is this super cute fox sweater! The sweater is navy blue with an orange fox wearing a gold sequin bow tie. I like to pair this sweater with a blue and white striped button up underneath and my pearls. My favorite part is that the fox's tail wraps around to the back of the sweater! Make sure you check out Ella's blog post to see her favorite sweaters for the winter time!